I got inspired tonight and decided to create another card. I enjoy making cards to give to Paul "Just Because" or at times when he goes out of town and I put inside his suitcase. He has a stack of the all the ones I have made thus far. For this card I used some Red Paper for the base of card and then added a cute pink heart printed paper I had in my stash. 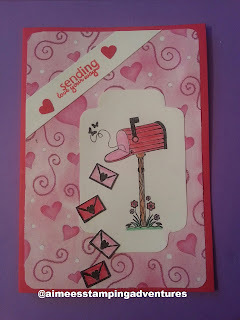 I used stamps from the "Sending My Love" Stamp Set. I think it came out cute. Thank you Eva!. Its one of my favorites I have made thus far :). Entered in contest - who knows.